This is the third podcast by Better Off Out, introduced by Rupert Matthews the National Campaign Manager. You can find Better Off Out on Facebook, Twitter and YouTube as well as on our website www.BetterOffOut.net. We welcome all Brexiteers and offer a wide range of campaigning materials and activities. Go to our website and check us out. Meanwhile, this podcast takes us on a trip to Durham to talk about heavy industry, we remain in Durham to talk about the Bold Durham Hussar who fought against Napoleon’s efforts in the 19th century to create a single European Empire. Then we move on to Devizes for three different pieces. 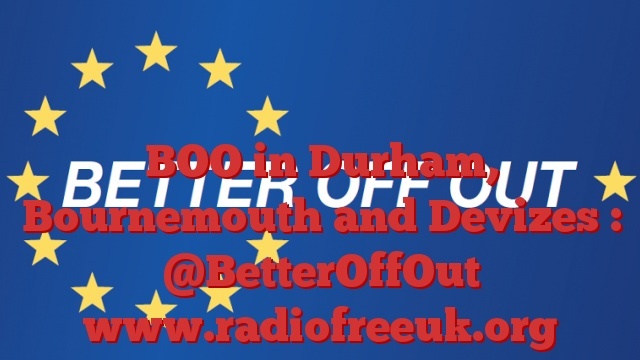 First we have the launch of the Better Off Out campaign in Wiltshire, followed by a couple of shorter pieces looking at the Market Place and its relationship with the European Union. Richard from Wearside talks about the impact of the EU on the shipping industry. Rupert Matthews of Better Off Out stops off at the statue of the Earl Vane, a great war hero of the Napoleonic Wars to compare and contrast the behaviour of Napoleon and the EU. The Better Off Out Team leaflets the Liberal Democrat Conference in Bournemouth. Next Rupert Matthews of Better Off Out goes to Devizes to launch the Better Off Out Campaign in Wiltshire with – among others Julia Reid MEP. Also in Devizes Rupert Matthews goes to have a look at the old Market Cross to learn about an ancient legend and what it can tell us about the future of Free Trade with the continent of Europe. Before leaving Devizes Rupert Matthews has a chat about the Market and how it is affected by EU Regulations. as a supporter of the movement I would like those who disagree with the taxpayer funded propaganda leaflet should post it back to Conservative Campaign HQ.FREEPOST, 4 Mathew Parker St,London SW1H 9HQ. This way the perpetrators pay rather than the taxpayer.